The name Alan Trustman might not ring a bell, but some of his work might. 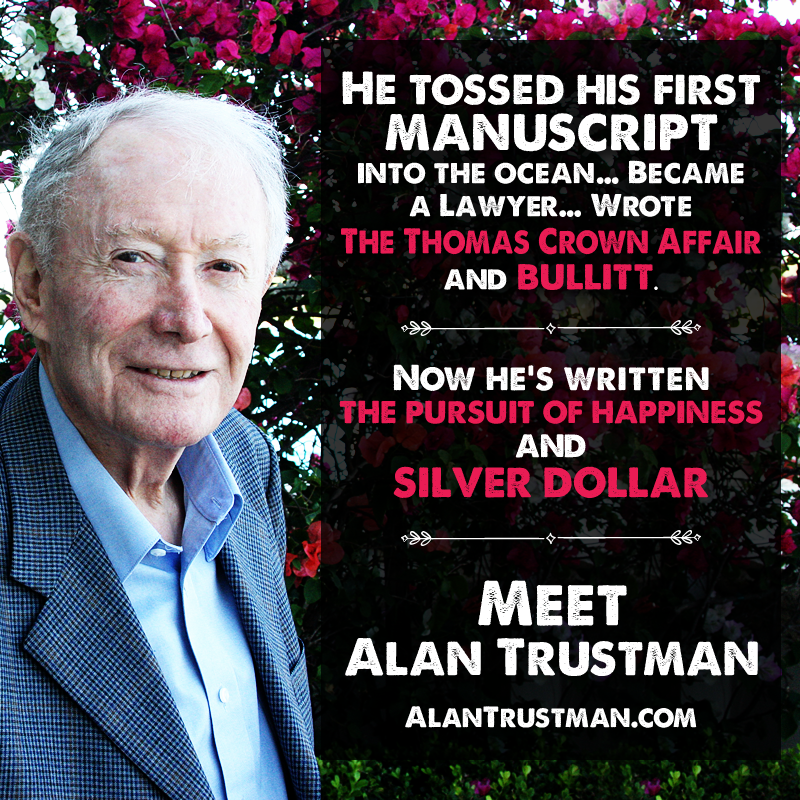 Trustman is the writer of The Thomas Crowne Affair, Bullitt and They Call Me Mr. Tibbs! as well as an American lawyer, pari-mutuel operator and currency trader. We sat down with Alan to to ask him 10 questions. He kept his answers, like his writing, short but sweet. You wrote The Thomas Crown Affair, which is one of the best films of all time starring Steve McQeen and Faye Dunaway. What was the inspiration behind the story? I worked at The First National Bank of Boston during the summer of 1955 and had a plan to rob the Thursday P.M. cash transfer to the vault which would have worked. I love writing. It is absorbing and effortless. I sit at my keyboard and look at my 50-inch screen and it happens. You threw your first manuscript into the ocean. Why? It was terrible. Embarrassing. Ashamed to show it to anybody. It was a bullfight murder mystery which I turned into a screenplay 30 years later, and never sold the screenplay. What lessons have you learned in law that influences your writing? I learned to write shorter and shorter contracts, and sentences, and ultimately dialogue. My prose has none of the elaborate descriptions and word play generally favored by the New Yorker critics, and I will never get rave reviews, but that’s fine; I am an easy read. A quick read. All plot and dialogue. You left law to pursue writing. What made you leave? (1) I had a serious tax problem, an 83% tax federal and Massachusetts. (2) Initially movies seemed exciting. (3) Every top lawyer sooner or later makes a major mistake and I hadn’t, yet, but was working on bigger and bigger deals. You seem to be a man of the world. What’s your favorite travel story? I arrived in Paris from San Sebastian in August, 1951, broke and seriously ill with amoebic dysentery and got a job hustling rich American travelers in Paris into changing money at the illegal Swiss rate, which was 12% better. Tell us about a little about your relationship with Steve McQueen, who starred in many of your movies? Distant, but friendly. He took me clothes shopping for his half million dollar wardrobe for the picture, realized I was bored out of my mind, grinned and said, “Well, it’s better than stealing hubcaps.” I had to like him for that. He was stealing hubcaps while I was at Exeter and Harvard. Find something you enjoy and do it. The money will somehow take care of itself. I read your book The Pursuit of Happiness, and was hooked. What was the writing process for this book? I wrote the slam bam opening, looked at the screen and wondered what should happen next. It did. And then it kept happening. As for Silver Dollar, a friend was taking a short story course at Hunter, had an idea for a first date couple traveling the world, but had no ending and couldn’t finish it. I finished it for her and somehow kept writing and writing and got a novella, a woman’s easy read. A play. I have never written a play before and know nothing about plays or the business.